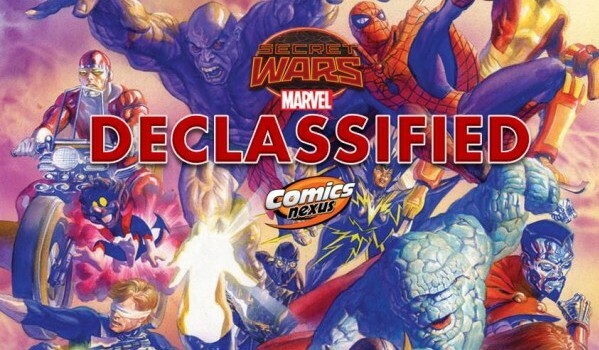 Secret Wars Declassified Week 26: Doom Doomed! Gauntlet Gone! Squadron Squashed! Thors Triumphant! NOTE: no new books shipped on Nov. 4, 2015. This entry is for the books released on Nov. 11, 2015. The preceding column are for the titles shipped on Oct. 28, 2015. The much-anticipated seventh issue of the main series peeked its head!! In less than a week, the entire first print run sold out!! A second printing will be coming in early December. On that note, issue eight was to be released two weeks from now but has been postponed until December. 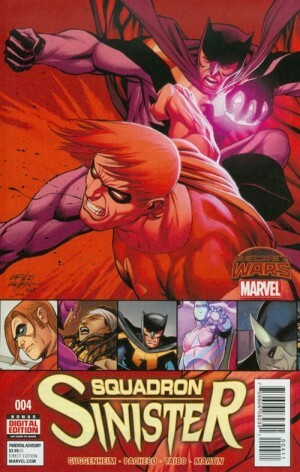 There is speculation that the ninth and final issue may come out in January. *sigh* Just end the torture already!! Three more series fade away. One has major ramifications whereas the other introduces a new iteration. My biggest beef is the two-month gap among all three simply because of the lateness of the main series. GGGRRRRRR!!! For my lengthy look at number seven, click on this. This is it, True Belivers!! 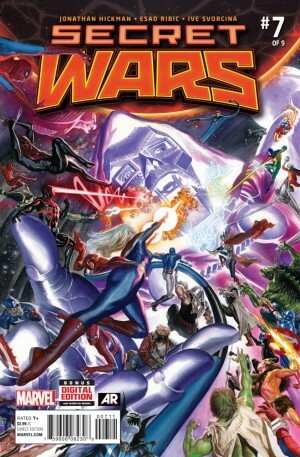 The ultimate showdown between the Mad Titan and the newly-formed Nova Corps!! Eve is gravely injured but still alive. Her essence is trapped within the Soul Gem. The Bakians as well as the three Guardians have to evade a Behemoth before they set their sights on Thanos. Star-Lord, Gamora, and Groot each don a Nova Star giving them a power boost to aid the clan. Speaking of which, the purple-pussed purloiner is battling his past self. Or is that future?? Breaching the space-time continuum is always a head-scratcher. Well, the main one emerges triumphant. Zig has caught a whiff of the death worshipper. The Bakians are in hot pursuit. Literally!! The last gem is within a volcano. Anwen takes hold of the Reality Stone and goes all Voltron. That move lasts less than a minute. 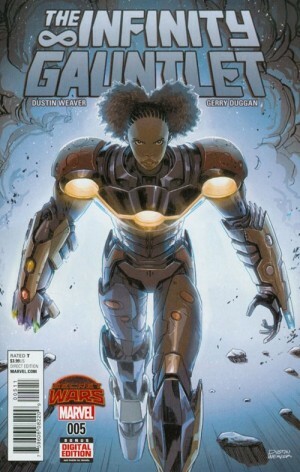 Thanos begins to pummel her. He is annoyed that she choose not to be his thrall. He could have tutored her. Menzin can’t bear to see his daughter beaten to a pulp. With a Herculean effort, he unleashes the Reality Stone. They all seem to perish but the gauntlet lies without a wielder. Thanos is still standing. Anwen seems to relinquish the last gem but it’s all a ruse!! She has deceived the power-crazed bore. Thanos is reduced to ashes as is the gauntlet. Anwen is reunited with Eve in the Soul Gem. The title is the best indicator but just in case you need a major clue: the bare-knuckled brawl between the last two standing is a deliberate take from the Distinguished Competition’s opus DKR. Nighthawk, with the Power Prism and Argonite, brings Hyperion down a few notches. Meanwhile, in Nutopia, Sandman convinces Starbrand Jacob Burnsley to take advantage of the dissension in Utopolis. He arrives with a host of Starbrand in time to witness Hype expire at the hands of ‘Hawk. Kyle Richmond strangled his opponent with his bare hands. Sandman blasts his way into the action. Nighthawk has that pesky prism to keep his attackers at bay. Jacob won’t let up. 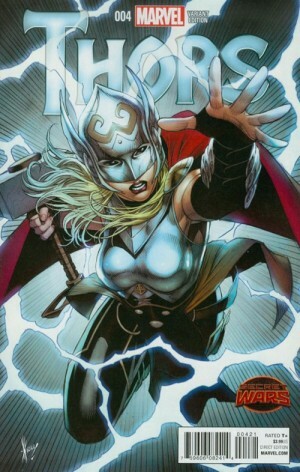 Hostilities cease when the Thor Corps drop their hammers. He is summoned before God Emperor Doom. Nighthawk tries to justify the events gone awry. Doom is less than impressed. 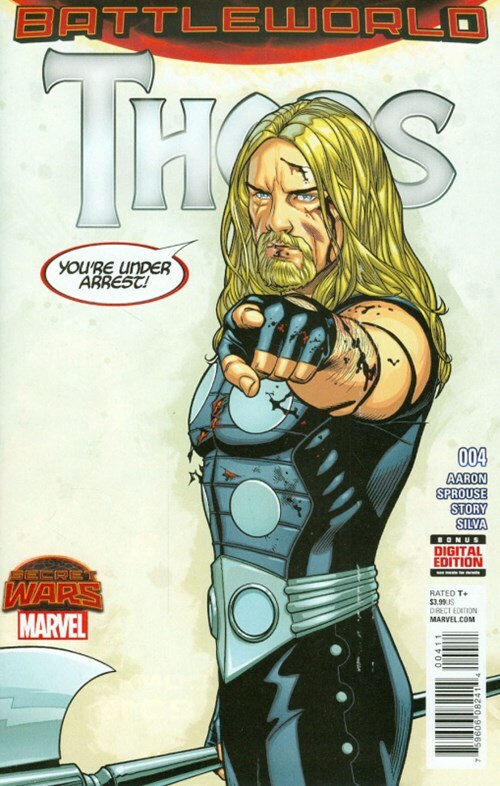 Kyle is cleared of the Iron Thor’s murder but he faces other charges – incursions into the neighboring territories and the murder of Utopolis’ baron. The one witness that can verify the alleged actions is Warrior Woman!! She definitely sold him down the river. Dolt! Nighthawk accepts his banishment to the Deadlands. He will die trying to resist the zombies. Jacob decides to annex the former domain into Nutopia since the despot is deceased. Ironically, the residents resist. They will hold their own rather than accept the help of foreigners. It’s going to take a lot of convincing. 360: To quote a quote – “Better the devil you know than the angel you don’t.” Hama Tuma. The road to hell is paved with good intentions, yadda, yadda, yadda. NOTE: The scene with Jane Foster takes place in SECRET WARS #7 and expands in SECRET WARS #8. Accusing a Thor of murder is pure lunacy. Accusing two and presenting evidence is ballsy. Ultimate and Unworthy (Lief and Odinson respectively) are determined to expose Rune and Destroyer. Things are going terribly for the respectable officers. Rune confesses to killing all the alternate versions of Donald Blake and Jane Foster. He did this to ensure the sanctity of the Thor Corps. For whatever reason, Jane was a menace to their existence. Coincidentally, Jane from the 616 (unbeknownst to her colleagues) rallies the troops. She decries Doom’s false godhood. There is outrage and denial among the crowd. She emphatically states that the thunder in her words rings true. Rune denounces them all. He drops his hammer quickly realizing that he has lost his worth. He is kicked to the curb. Odinson glances at Rune’s hammer and contemplates lifting it but decides against it. Lief flies ahead with the mainstream Thor and realizes that she is Jane Foster, albeit from a different reality. She admits the newness of her status and how she is still processing this life change. He assures her that her worthiness makes her an ideal candidate. In the midst of brawling with some villains, Lief hurdles his hammer so hard that it breaches a dimensional barrier to Old Asgard. The inscription on it is awaiting another one who is deemed honorable and virtuous.